It is very important to have a veterinarian examine your cat at least once a year, twice yearly as they mature. Cats age significantly faster than humans and therefore it is imperative for cat owners to stay on top of wellness exams in order to catch any potential health problems before they begin. Most cat illnesses are much easier and less expensive to treat and cure when caught in the early stages before they progress or develop complications. 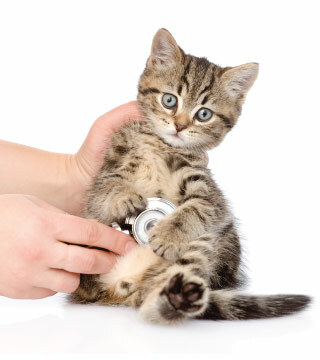 Therefore, regular cat wellness exams are the cornerstone of preventive veterinary medicine. Cats are good at hiding any type of illness, by being quiet and hiding, You may not be fully aware that something is wrong since cats can be experts at hiding pain or discomfort. By nature, cats are independent animals, however they still need to be examined by a veterinarian at least yearly. At 4 Paws Veterinary Care, we recommend performing basic lab tests at least once a year, as well as reviewing nutrition and any behavioral issues you may be noticing. Of course, we realize that some cats don’t like getting into the cat carrier and going for a ride. In these circumstances, we recommend coaxing your cat into his carrier by using a treat, and trying to soothe your kitty during the car ride. Additionally, utilizing a pheromone spray on a towel that goes into the carrier and in the car can help soothe your cat during the ride. Cats should have a thorough dental cleaning around age 4, generally. We will do a dental exam and look for any abnormalities in the mouth. By age 4 virtually most cats have some kind of painful dental issue. In addition to problems with their teeth, cats can develop tumors inside of their mouths and since they are so adept at hiding pain, especially dental pain, it is very easy to overlook these issues. However, make no mistake, dental issues are painful and seriously affect the quality of life. At 4 Paws Veterinary Care we assess the body condition of the cat, and determine if he is the correct weight. A wellness exam also includes palpating the abdomen for organ size and shape making sure that all is normal and checking for any lumps or bumps. We will also collect urine and blood samples for yearly labs. Preventative care is extremely important, along with vaccines, parasite control and deworming.